Just when I thought we had a great new product, someone shows up with something better! Here is our newest addition to the MikroRouter Line, the MikroRouter 8000ux2. I like this router for a lot of reasons. First, it has the power to replace a lot of high end (read expensive) gear with a lower cost alternative with all the power of RouterOS. It fills the gap in the Cisco lineup and in addition, the LCM display on the front is really nice and gives valuable information, rather than “Network Appliance” or the router brand. It gives throughput, CPU load, memory, uptime and a lot of other useful info. 36 cores! Are you kidding me? Well, if more is better then my new MR8000ux2 isn’t as awesome as a I thought. 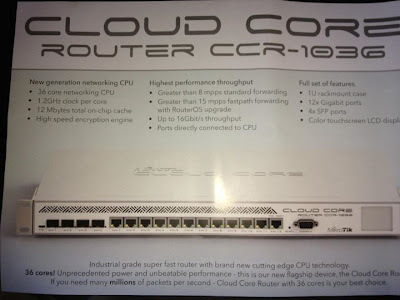 But wait a minute, the MR8000ux2 is in stock and shipping but the Cloud Router is still in the “cloud”. Maybe less IS more! MikroRouters are available from ISP Supplies in College Station, Texas.